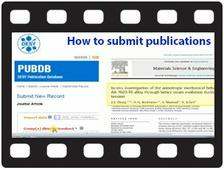 Please log in DOOR and select "Register your Publication" in the "After beamtime" section. Short training video (3 min) from the DESY library on 'How to register your publication in the DESY Publication database'. Please submit all your publications related to experimental or theoretical research activities at DESY Photon Science via DOOR to the DESY publication database PUBDB. References are an essential element in how funding agencies review research productivity and scientific output. All staff and users are obligated to submit the citations for any paper based in whole or in part on research done at DESY Photon Science. Please help us to present a complete picture of the photon science research being performed at DESY. A login (via the user administration system DOOR -> 'After beamtime -> Register your publications') into the PUBDB is always required, if you want to enter, change or update your publications. You can import your publication data automatically in the PUBDB by using digital object identifiers of your publication like DOI, PMID, WOS, PPN etc. PUBDB entries will not be visible online immediately after your bibliographic information has been saved. All entries will to be checked for completeness, spelling errors etc. by a DESY publication appointee (e.g. from DESY Photon Science or the DESY library).